If you have facebook, you can watch it here. The deadline for PERSONAL MESSAGES AND PHOTOS has been extended to FRIDAY, APRIL 5. Don’t miss out on highlighting your gymnast or team on the BIG SCREEN! Sponsors’ deadline is also now Friday, April 5. Highlight your business, meet or camp for a great price! Find mor e information on these opportunities on our website. You will find all meet information on the website including parking information, admission prices-Remember, CASH ONLY-, host hotels and vendors on the website. We are looking forward to a fantastic Championships weekend. See you soon in Corvallis! The RACC Election will be conducted online at http://www.usagym.org from April 1 – April 15. 4) That your Professional membership, safety certification and background check has been fully processed and current. If you have any questions regarding your voting privileges, please call USA Gymnastics Member Services – 1-800-345-4719. 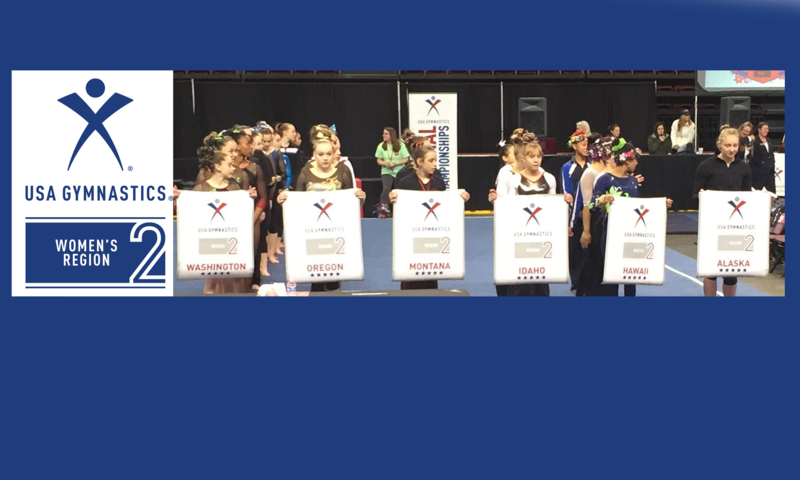 2019 Level 8 – 9 10 Regionals April 12- 14 in Corvallis, Oregon. 2019 Level 7 Invite April 11 in Corvallis, Oregon. Congratulations Mya and Mackenzie! Great job representing Region 2 at the Nastia Cup! Mackenzie Estep in the junior division from Auburn and Mya Lauzon in the senior division from Metropolitan. 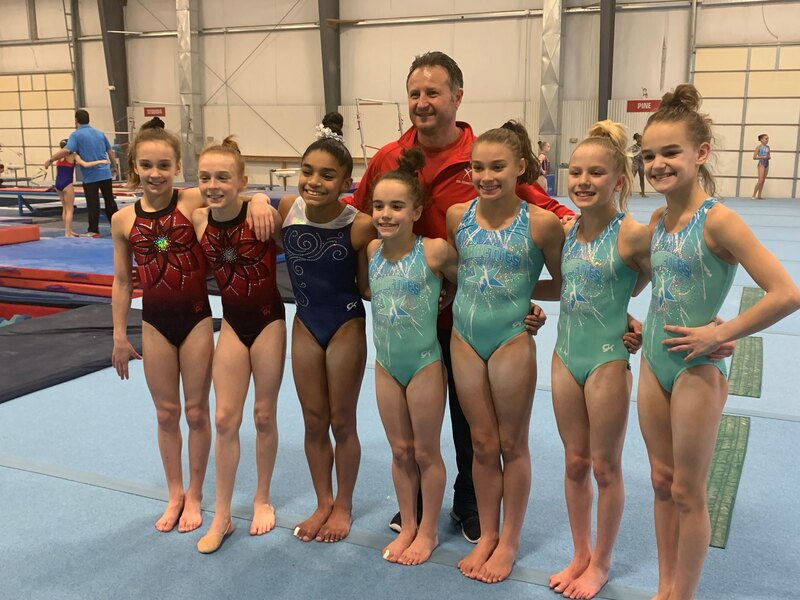 Representing Region 2 at developmental camp from Auburn Gymnastics Center are Hailey Avellar and Isabelle Futch (far left and the 2nd gymnast) as well as coach Ivan Alexov the Region 2 JO Chairman. All nominees who are eligible candidates for each office will be placed on the online ballot. A call for nominations by the Regional Administrative Chairman must be published and/or posted online for a minimum of one month prior to the submission deadline of no later than March 1. The following statement will be placed on the USA Gymnastics national website and e-mailed to all Women’s Professional Members who have current e-mail addresses. Each Region and State should post it on their websites so that the Professional members are aware of the voting procedures and their responsibilities to ensure that their vote will be counted. d) That their Professional membership, safety certification and background check must be fully processed and current. 6) Each RACC electronically sends to the Women’s Junior Olympic Program Director the name, city and state and the résumé of each candidate (no photos) in a Microsoft Word document no later than March 15th. 7) The official Slate of Nominees for each region will be posted on the USAGymnastics website, with voting to begin by April 1st. The voting will be concluded on April 15th. 8) Regional officers shall be elected by majority (1 over 50%) of the votes cast. 9) If no candidate receives a majority vote, a run-off election will be held between the two (2) candidates receiving the most votes. The run-off election will allow all Professional members who were current by March 31 to vote. The Women’s Junior Olympic Program Director will work withthe individual RACC on the procedures for online run-off elections. 10) In the case of a tie in the run-off election or in an election with only two candidates, the National Chairman of the respective committee will vote to break the tie. 11) Write-in votes will not be allowed. 12) If only one nomination for regional office is received, the National Chairman of that respective committee will cast one (1) vote and the nominee will be elected by acclamation. This information is also to be sent to the Director of Program Administration by March 15. 13) The week after April 15th, the RACC’s will receive their respective region’s election results by email, including the actual vote counts in the event that any of the candidates wants to know this information. The RACC’s will notify all of the candidates of the election results. 14) Election results will be posted on the USA Gymnastics website. In the November meeting, the Technical Committee reviewed a number of questions which were presented by the gymnastics community. These topics will be discussed and finalized at the Joint JO and Technical Committee meeting in May, but for the purposes of giving direction for the 2019 winter/spring season, these questions and answers will be posted on the Regional websites -Technical page. Any additional questions should be submitted to your respective Regional Technical Committee Chair, who will share them with the other RTCCs for inclusion on the Regional websites. Q1: What is the correct mat stack specifications for the Level 2 Vault? There is a discrepancy between the R&P and the JO Compulsory book. A1: Compulsory book is correct. R & P will be updated. Minimum of 16”, 24” or 32” (+ 1”). Q2. Can an Inquiry include the “Not Up to the Level of competition” Composition deductions? Q3: Can Meet Directors pay judges by alternative methods such as Pay Pal or Venmo? A3: Yes, if there is agreement between the Meet Director and the individual judge prior to the competition. Q4: May the gymnast wear a medical bracelet while competing? A4: Yes, but it should be covered by tape or some type of bandage. Q5: May animals be present at USA Gymnastics sanctioned competition? A5: For the safety of the athletes and other participants at a competition, it is not acceptable to allow animals in the competition Field of Play. In compliance with the Americans with Disabilities Act, designated/qualified service animals would be allowed in the competition venue (spectator area). Q6: Is the “Incorrect attire” deduction different for JO and Xcel competitions? A6: Yes, 0.10 for Xcel; 0.20 for JO, after a warning, taken on the next event. Q7: How is the angle of arrival determined for Level 6/7 Vault? A7: If there is a closed shoulder angle, measure from shoulders to hips. If there is an open shoulder angle, measure from the hand to hips. Q8: How is the angle of repulsion determined? Q9: What is the deduction for landing sideways on a Level 6/7 Tsukahara timer vault? A9: There is no specific deduction at this time; deduct for any applicable direction, body position and execution errors. Q10: Is there a deduction for not going through vertical on the Level 6/7 Tsukahara timer? A10: Not specifically; use appropriate body alignment and/or direction deductions. Q11: What is the deduction if a Level 6/7 gymnast vaults with the Vault Table below 115 cm? A11: Apply the 0.30 deduction for incorrect apparatus specifications. Q12: Must the mat behind the Level 6/7 mat stack be placed in a certain direction? A12: The mat behind the mat stack may be placed sideways or lengthwise at this time. Q14: When do you start counting for a concentration pause? A14: You begin counting when the gymnast is stationary or is readjusting arms, feet or body prior to initiating an element or series of elements. Happy New Year Everyone! I wish everyone a fabulous season. Many of you have already had your first meets. Here are a few updates for the season. Questions that have come up: The WTC committee reviewed questions which had been presented by the gymnastics community at their November meeting. These topics will be discussed and finalized at the Joint JO and Technical Committee meeting in May, but for the purposes of giving direction for the 2019 winter/spring season, these questions and answers will be posted on the Regional websites – Technical page. Download the full newsletter.